Phew, it is going to be a busy day around here for me! Let's start with the main event: Canon has announced the EOS 6D, a cheaper 35mm-sized sensor camera aimed at the Canon crowd. It has a 20 megapixel sensor, but unlike the Nikon D600, Canon has done its old trick of using a lesser AF system: In this case, it is a new 11 point system with just one cross sensor. Canon claims it will be able to focus in darker environments, so maybe it will make up for the single cross point. Or maybe it won't. 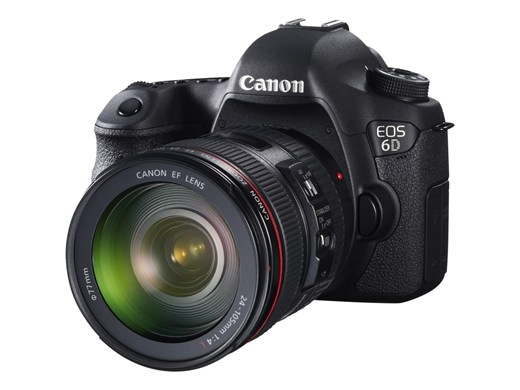 The rest of the specifications mostly matches up to its status as the kid brother to the 5D-series: 63 zone metering system, 4.5 frame continuous advance, a 3.2" VGA LCD display, a 97% viewfinder, a 1/180 flash sync speed. Video is available, and it is pretty much like any EOS DSLR: 1080p at 24, 25, and 30 FPS. There is also WiFi and GPS built-in, and with the right app on a smartphone (Android and iOS are supported), the phone can be used as a remote viewfinder. Ships in December for US$2100 for the camera alone, or US$2900 with the EF 24-105mm f/4L IS USM lens. See the read link for a preview by DPReview.com!